Our own goldenstringradio.org dj, Walter Mootz was a big winner at this year’s Golden String, “Beer, Wine, and Chocolate” Fundraiser. Not only did Walter get to sign autographs for throngs of adoring fans, he raised money for his upcoming Las Vegas vacation, and won a giant Whitman’s Sampler Candy Box to boot. 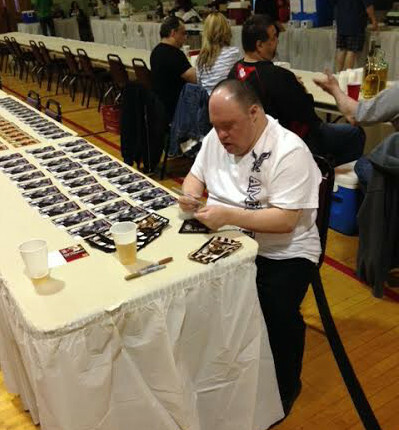 Golden String was delighted to host Walter and the event at the Father Snock Center at Our Lady of Sorrows Parish. Thousands of dollars were raised and many medals for fine wines and beers were awarded. Winners will be listed on the websites soon. Thank you to all volunteers, employees, and Youngstown community members for your support. All funds raised will go directly towards goldenstringradio.org and the new “Gallagher’s Restaurant” at the Oakhill Renaissance Building.